SELLER SAYS SELL!! JUST REDUCED!!! WELCOME TO THE HIGH DESERT - LOCATION LOCATION LOCATION! 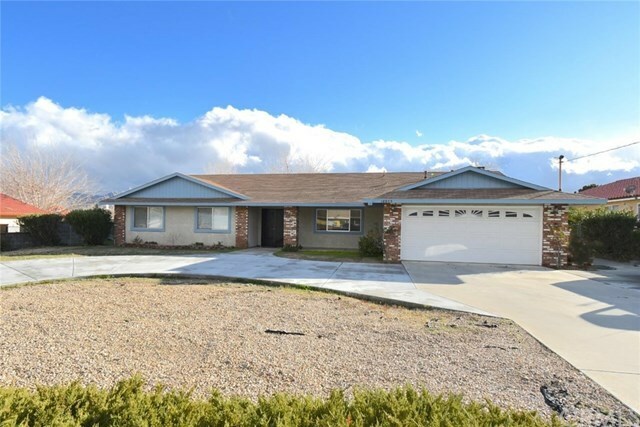 Well cared for, original owner home around the lovely Mesa area in Hesperia - the gorgeous So. Calif. High Desert! Lovely circular drive w/ great curb appeal! Upon entry you are greeted w/ an open, airy floorplan. Lovely step down formal living room and expansive formal dining area. Huge kitchen with tons of cabinets, breakfast bar, built in shelving & bright breakfast nook! Just off that is the cozy family room w/ a lovely raised hearth fireplace! Three good sized guest bedrooms all w/ ceiling fans & mirrored closet doors! Roomy & cozy master suite with its own fireplace & large picture window. You will love the master bath w/ separate dressing area, walk in closet and step in shower! Sizeable indoor laundry w/ convenient 1/2 bath! New AC unit, newer laminate flooring throughout, newer water heater, swamp cooler, large storage shed in backyard, lovely trees in backyard, finished two car garage and MORE! You will NOT be disappointed with this home! Take a look today! Directions: 15 Freeway North Up the Cajon Pass - Exit Main St to Arrowhead Lake Rd - turn Right on Danbury - make almost an immediate U turn on Arrowhead Lake Rd Outer to Westlawn go Left to piq on left hand side!